Are you planning on getting a pool operator certification? Then you should know that keeping records is an essential aspect of a pool operator’s everyday duties. Record keeping helps organize and centralize all of the information necessary to properly operate an aquatic facility. Good records help illustrate how an aquatic facility operates, reduces wasteful spending, ensures pool/spa safety and reduces liability to the facility. Going over the basics of record keeping is a great jumping off point for anyone preparing to get a pool operator certification. Proper record keeping plays a big part in many management operations of an aquatic facility. Records are required to protect against potential lawsuits and can be useful while defending against a lawsuit. In order to operate an aquatic facility the right way, all pool operations must be carried out on time and recorded precisely. Diligent record keeping allows pool operators to account for any day in the case of a lawsuit. Every facility should record all key events involving pool and spa operations. Proper record keeping is essential for a myriad of reasons. In addition to helping provide legal defense in the event of a lawsuit, it helps a facility comply with all governmental safety and sanitation requirements as well as documents any injury that occurs. Records also play an important role in the business side of managing an aquatic facility. Maintenance records, opening and closing checklists, inventory, and training schedules help management come up with a budget. 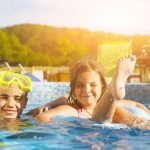 While safety and sanitation are the highest priority, the aquatic facility still needs to make a profit to remain operational. The most basic, yet required aspect of record keeping is the continuous recording of daily operations. Each day, pool water chemistry must be adjusted to standard requirements and recorded. You will be documenting that all suction outlet covers are in place and all safety equipment is functional. You will also record the water clarity, gauge and flow readings each day. The local laws and regulations that dictate pool operation change from facility to facility, so it is up to management to develop a daily checklist that covers every requirement. When opening and closing a pool, unsafe and unsanitary conditions should be recorded and corrected before anyone enters the pool or spa. If the issues can not be corrected before opening, no one should be allowed access. The following checklist can serve as a jumping off point for opening and closing a facility, but regulations differ from place to place. Again, this is just a foundation, you will learn much more while getting your pool operator certification. You can learn from the experts about pool safety and management. The CPO® certification class is a great start to becoming a pool expert. Pool Operation Management’s award winning CPO® certification courses train you how to properly operate a swimming pool in the most energy-efficient way. Our two-day courses offer a wealth of information and training in everything from pool chemicals, to energy conservation to risk and liability. For the very best in pool operation, contact us today.